We decided to continue exploring the area around the lake. While exploring we met up with an older gentleman who said he was living out in nature so he could find balance in his life. We sat down and broke bread at his fire. While we were eating the man came up and back stabbed our fighter. Right after that happened a large cat came bounding out of the woods and pounced on the fighter too. The cat knocked our fighter out cold. Our bard cast a rage spell on me to help me increase my damage and attack on the puma. I struck a hard blow against the large cat. Then Skoll (my wolf) bit the cat. At this point the cat was looking pretty beat up, and he was bleeding all over the place. He bled out shortly after that, so me and Skoll went after the old man who had back stabbed our fighter. The wolf and I both got good hits in on the old man, and our summoners eidolon managed to take him the rest of the way out. Once we revived the fighter and our cleric healed him all up, the fighter decided he needed a new cloak made from the skin of the cat we’d just killed. 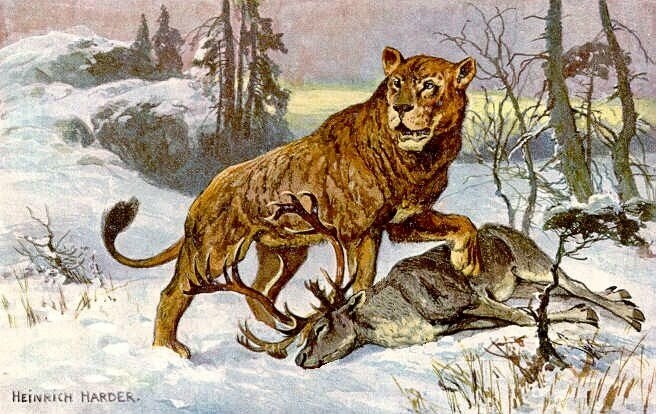 He also took the teeth of the lion and made a necklace for the eidolon who had taken out the lion. The eidolon looked confused when he was given a necklace, but he put it on anyway. Once the fight was over we explored the area. We found a tree hollow where the old man had been living. Buried deep in the bottom of the hollow was a chest with lots of goodies inside. While we were exploring our cleric spoke to the recently departed spirit of the old man. He asked us if we would please take his body to his brother (a man the rest of the party had met before my arrival with them). In the chest was a locket wrapped in cloth. On the cloth was a map showing the northern shore of Tuskwater lake, and a bit of area east of it, between 2 rivers. We spent the night in the camp while our bard studied the weird symbols and runes on the map. He discovered that the map is to a tomb, which is guarded by undead creatures. Inside this tomb is a magical weapon of great power. The next day we headed out continuing our explorations. While exploring we came across some bears. We left them alone, giving them a wide breadth. Next we arrived at a fence with a smallish house in the distance. There was a scarecrow in the yard. Our bard had previously been some rumors of a witch in the area who was eating children, so it seemed like a good idea to check this house out. There was smoke coming out of the chimney of the house. There was a bell on the outside of the gate which I rang. An older (and quite scary) looking woman came to the door. I shouted at her to let us into the house, while making the most intimidating posture I could. I told her there had been rumors of problems in the area and we were investigating. She yelled at us to get off her property. I demanded that she let us in, seeing as how the ruler of this entire land was with us. The old woman slammed her wooden window shut. Our fighter decided he was tired of this crap and busted down the fence. He ran about halfway up to the house, with me, and the summoners eidolon following right behind. While I was coming up I suddenly noticed the scare crow in the yard come alive. He was able to get a spell off on the fighter and I, though he missed the eidolon who quickly took to the air, before turning around in a dive bomb trying to hit the scarecrow. However the eidolon then became caught up in the spell as well. Our summoner who was staying well back from this whole thing tried to cast a light damaging spell on the fighter to get him to snap out of this daze he was in. The summoner screwed up somehow and managed to hit himself with the spell. (metagaming moment, at this point the whole table was rolling with laughter). His supposedly light spell managed to take out about half of his health. At this point the woman came out of her hut and came up and pushed our fighter to knock him out of the spell her scarecrow had cast. She accused us of being bandits trying to come onto her property and steal all the things she owns. Our fighter managed to talk her down and explain to her we had been sent to establish order, and that the new ruler of the area was with us. The fighter asked her what had happened to her to leave her looking so much like a hag. The woman stated it was something to do with magic. Then the fighter explained we just wanted to come onto the property and take a look around to make sure everything is ok. She says that is reasonable and allows us to look around the place. She said that she had heard the rumors about how she is eating children. She wants us to look around and make sure everything is ok, and spread the word that she in fact does not eat children. The cleric took a shine to the old woman and offered to leave some wine for her when we left. (Kind of odd to see the cleric willing to share her wine with anyone…) So after looking around and not finding any evidence of anything shady going on, we deemed that she was ok. She offers to make magical items for us at the standard price should we ever need them. She tells us that there is an island of lizard folk to the west. We offered to erect a sign just outside her gate to let others know that she is ok to stay in this area. She does ask us if we can do her a favor. There is a certain type of mushroom that she really likes and is offering to pay top gold for if we are able to find some and bring it back for her. We camped out that night in her yard, then left her hut and continued on with our exploring the next day. We came across a different lake called Candlemear, and our bard remembered hearing stories of strange lights dancing across this lake, oddly enough named Candlemear lights. In the middle of this lake we come across a Lizardfolk village on Candlemear island. The bard and fighter go across the river and find out there is a human child within the walls of the village. They can hear the human child screaming and crying. The lizards mention they have to scare the child to appease their Lizardfolk god. At this point the fighter calls across the water and the rest of us swim across to the island and join the bard and figher where we get filled in on whats going on. 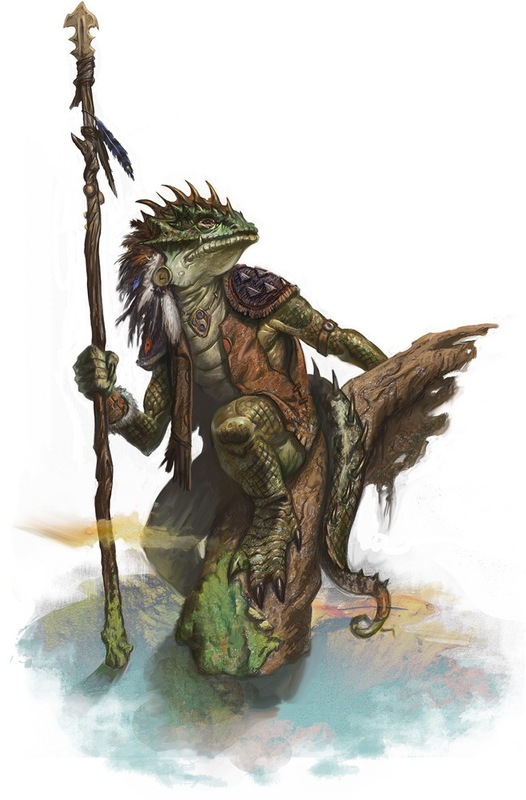 When we arrive a floating orb of light comes out of the center of the village and asks “What is going on here” while the Lizardfolk cower in fear. That is where we leave off the adventure for today. To be continued!